"Sooner or later, gunna have to fight him." BH Tilt has just unveiled a brand new trailer for Birth of the Dragon, a fictional feature based on the true story of the legendary Bruce Lee. This film is controversial because it's not an accurate depiction of the events or history of Bruce Lee, and had a white main character but this new edit is apparently much better. Starring Philip Ng as a cocky, young Bruce Lee living in San Francisco training and teaching his kung fu skills. 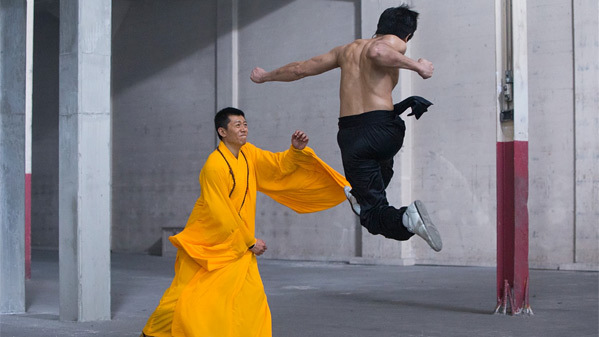 He is confronted by a legendary Shaolin monk named Wong Jack Man, played by Yu Xia, who is upset that he is sullying the art and spirituality of kung fu. The main white guy is played by Billy Magnussen, with a cast including Jin Xing, Jingjing Qu, and Simon Yin. The publicist is keen to point out that this is a brand new cut of the film, not the version seen at TIFF. You can still see the first promo trailer for Birth of the Dragon here, for a different take on this film. Young, up-and-coming martial artist, Bruce Lee, challenges legendary kung fu master Wong Jack Man to a no-holds-barred fight in Northern California. Set against the backdrop of San Francisco’s Chinatown, this cross-cultural film chronicles Bruce Lee’s emergence as a martial-arts superstar after his legendary secret showdown with fellow martial artist Wong Jack Man. Birth of the Dragon is directed by American writer-turned-filmmaker George Nolfi, director of The Adjustment Bureau, and writer of Ocean's Twelve, The Sentinel, The Bourne Ultimatum and the TV show "Allegiance" previously. The screenplay is written by Christopher Wilkinson & Stephen J. Rivele. This first premiered at the Toronto Film Festival last year. BH Tilt will release Birth of the Dragon in select theaters starting August 25th. So who still wants to see this?